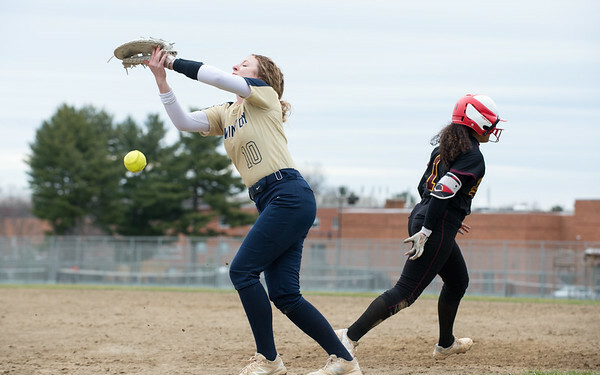 NEWINGTON - In Wednesday’s thrilling comeback win over Middletown, the Newington softball team was the beneficiary of an opponent’s mistake, scoring the game-winning run on a wild pitch to secure a 7-6 win. On Thursday against New Britain, the Indians experienced the other side of the spectrum, committing an error and two passed balls, all which led to Hurricanes runs in a 4-1 victory for New Britain. The Hurricanes (2-1), meanwhile, played flawless defense behind pitcher Josleen Rivera, who twirled a complete game shutout behind six strikeouts, after fanning seven in Wednesday’s game against Maloney. On the other side, the defense was shaky for the Indians (3-2) from the first inning, when first baseman Rachel Thureson booted a ground ball that allowed Rivera to reach base. After Rivera stole second, Amanda Jacobs lined an RBI single to center to put New Britain in front. Instead, it was the Hurricanes that broke through, capitalizing on every Indians mistake. After scoring its second run of the game on an RBI single by Xandra Silva, New Britain threatened for more with runners on second and third with two outs with Amanda Jacobs at the plate. Jacobs watched ball four glance off the glove of catcher Hannah DeMarco, allowing Paola Martinez to score from third. But the rally ended there after Silva was nabbed wandering too far off second base following the passed ball, ending the Hurricanes’ bid for further damage. Still, it was all the run support Rivera needed. The Hurricanes tacked on more insurance in the fifth, when Makaila Masterson scored on another passed ball after a leadoff single to go ahead 4-0, as the unearned runs began to pile up for Newington and starting pitcher Dani Pantano. Seeking a second straight comeback effort, the Indians’ bats came alive in the bottom of the fifth. Newington loaded the bases with one out thanks to a leadoff double by Elisa Taylor, a walk to Julia Szwez and a single to left by Cyan Gonzalez. Rivera struck out McKenna DeLuca for the second out, but walked Thureson so force in Newington’s first run of the game. The Indians flirted with more when Pantano smoked a grounder toward the third base line, but third baseman Amanda Jacobs was positioned perfectly to field it cleanly and tag the base to end the threat. The fifth inning was one of four frames where a Newington runner reached scoring position, but the Indians bats struggled for the timely hit, something that came in bunches in their previous game. Markie and the Indians thought they had the big hit when Demarco led off the seventh with a rope to left field, but Nataly Hernandez chased down the hard-hit liner and made a spectacular running catch, fielding the ball high over her head to spark a raucous celebration from her teammates, and a disappointed shock from the Newington bench. Instead, Rivera cruised to a win behind Hernandez and a spectacular defense that left no holes open for another Indians comeback. Newington had pounced on Middletown’s miscues 24 hours before, but the Hurricanes made sure they wouldn’t be part of an encore by eliminating any possible mistakes themselves. Posted in Newington Town Crier, Newington on Thursday, 11 April 2019 21:24. Updated: Thursday, 11 April 2019 21:26.